The I-10/ Highway 100 (sic) interchange has an estimated 550,000 vehicles pass through the area per day, making it one of the most heavily traveled intersections in the United States. Consequently, it features a high level of saturation from an advertising standpoint. There are already numerous billboards located adjacent to the interchange–many of which are controlled by LA Outdoor and CBS Outdoor–making the area susceptible to clutter and advertising overload.–From Draft Memorandum of Understanding between City of Los Angeles and Anschutz Entertainment Group, which calls for 41 new signs totaling almost 50,000 sq. ft. in that area. Miscikowski is still among the living, so she can’t turn over in her grave, but it’s hard not to wonder what she’d say to the latest proposal to add almost 50,000 sq. ft. of advertising signage to the 115,000 sq. ft. already up in the L.A. Live/Convention Center area downtown. Half of that new signage will be on the convention center facade directly facing the interchange of the 10 and 110 freeways, and added to signage already up will bring the freeway-facing signage to more than 37,000 sq. ft., or the equivalent of 55 full-sized billboards, in the space of just over three-quarters of a mile. 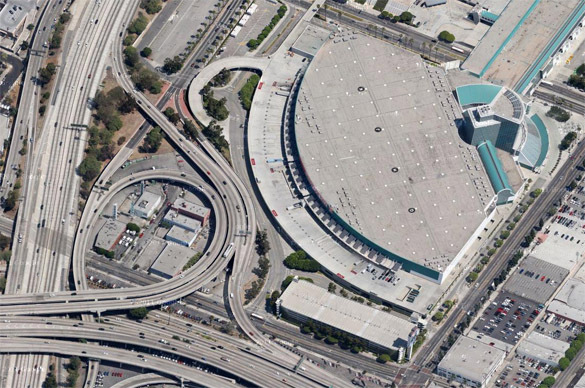 And that doesn’t include any signage on the proposed NFL stadium and new wing of the convention center to be built between Staples Center and the 110 freeway, just north of the existing convention center. Those structures will obviously present a lucrative opportunity for billboards and other signs displaying ads to the half million motorists who traverse the freeways in that area every day. In addition, a yet-to-be-built project just north of the stadium site includes a sign district to allow large supergraphic signs clearly meant for an audience of freeway drivers. The plan for signs on the long convention center facade, which comes within 100 ft. of the freeway at one point, first surfaced in 2008, when the city council okayed a deal with Anschutz Entertertainment Group (AEG) to allow the company to put up ads in exchange for a guaranteed $2 million in annual revenue. But a plan detailing the sizes, locations, and types of signs was never acted on by the City Council. The memorandum of understanding (MOU) just made public this week includes those size details, and the revenue the company expects from each of the signs. There would be 21 non-digital signs on the convention center facade, ranging from 1,032 to 3,750 sq. ft., as well as 18 others south and east of the convention center, where they would be only incidentally visible from the freeway. AEG is projecting annual revenue of $5.3 million from all the signs, and would honor the prior revenue-sharing agreement with the city. Nobody has publicly questioned that figure, and comparisons are very hard to make because advertisers and sign companies are normally tight-lipped about revenues from individual signs. However, in a 2009 court case involving Sony Pictures and a supergraphic sign company, documents show that Sony had agreed to pay $81,000 monthly for a 3600 sq. ft. supergraphic sign visible from the 405 freeway in West L.A. , which comes to approximately $270 per sq. ft.
By comparison, a 1,152 sq. ft. sign on the convention center facade facing one of the busiest freeways in the country would generate the equivalent of $209 per sq. ft., or 23% less. And according to rates available on Clear Channel Outdoor’s website, a full-sized billboard on a city street in L.A., with far less traffic than the freeway, could cost up to the equivalent of $151 per sq. ft.
A possible kink in AEG’s plans is a lawsuit recently filed in L.A. County Superior Court claiming that the many of the existing signs put up by AEG in the area are illegal because they are permitted as on-site signs but display off-site content. That lawsuit was filed by a company called L.A. Outdoor Advertising, which owns several full-sized, conventional billboards just across the 110 freeway from the sports and entertainment complex. L.A. Outdoor Advertising was cited by the city three years ago for illegally putting up those billboards without permits or inspections, and the company’s owner and sign installer have been charged with criminal violations of city code. The company subsequently sued the city in federal court, alleging that the sign code violated constitutional rights, but a judge ruled last year in favor of the city. The company’s owner, J. Keith Stephens, has also sued the city in superior court, claiming that exceptions to the city’s ban on new billboards granted to such companies as AEG is unfair and discriminatory. The signs in the area come under the jurisdiction of the L.A. Sports and Entertainment District Specific Plan, which includes a prohibition on off-site signs, but the definition of on-site sign is written so broadly that almost any product or service marketed on a sign could probably qualify. However, the California Department of Transportation (Caltrans) apparently has a different view of the matter, because a recent article in the L.A. Business Journal about the lawsuit against AEG quoted a Caltrans spokesperson as saying that some of the L.A. Live signs violate state permits in their display of off-site content.